Editor's Note: The fight for sensible land use is being fought in Seattle too. Like Marin, zealous planners, politicians and housing advocates are rezoning neighborhoods for affordable housing, micro apartments and the conversion of single family neighborhoods into multifamily apartment blocks. This is the idea behind the Priority Development Area in Marinwood and the rest of the 101 corridor. This is the future of Marinwood if they get their way and pass SB-1. It will allow redevelopment ANYWHERE without a declaration of blight. In May of 2009, a rumor was floating around City Hall. Homeowners on Capitol Hill were furious about a construction project. So one sunny afternoon, while workers hammered nails into a few unfinished buildings near 23rd Avenue and East John Street, I went knocking on doors to find out what the problem was. One neighbor was Alan Gossett. Gossett was trying to sell his blue Craftsman house, which shared an alley with the new development. Standing on the corner of his rear deck, Gossett pointed through the trees to the half-built structure and said, "I think this is going to be a magnet for very sketchy people." According to permitting paperwork, the building was a commonplace cluster of six town houses—the sort that would typically attract well-to-do buyers. But inside each town house, the developer was building up to eight tiny units (about 150 to 250 square feet each, roughly the size of a carport) to be rented out separately. The tenants would each have a private bathroom and kitchenette, with a sink and microwave, but they would share one full kitchen for every eight residents. The rent would be cheap—starting at $500 a month, including all utilities and Wi-Fi—making this essentially affordable housing in the heart of the city. And, remarkably, for affordable housing, it was built without any subsidies from the city's housing levy. But Gossett was bracing for 46 low-income renters in the space where he'd been expecting six new homeowners instead. Gossett and other neighbors felt hoodwinked, they told me. There was no public notification and no review process that allowed neighbors to pose objections. This was due to a loophole in the permits: The city and developers classified the building as six units (with up to eight bedrooms each), instead of as an apartment building with dozens of units, which would have required a more public process. Neighbors said they feared that the area wasn't ready for so many new residents and that the influx of newcomers would usurp on-street parking. But Gossett also seemed concerned by who his new neighbors might be. "Anyone who can scrape up enough money to live month-to-month can live there," he said, worried that low-income interlopers would jeopardize his chances to sell his own house. "I don't think most people want to live next to a boarding house with itinerant people living in it." This style of development is called microhousing, or in the case of this particular project, the developer, Calhoun Properties, has trademarked the name aPodments. Gossett and other neighbors said they should be banned. At the time, city officials certainly knew about the controversy—they were the ones who tipped me off to it—but after the outcry quieted that year when the real-estate market plummeted, officials lost interest. Seattle City Council member Richard Conlin, who was the council president in 2009 and recently took the reins of the council's land-use committee, explains, "Anything that doesn't seem to be a crying priority sort of gets put off." But four years later, neighborhood activism has surged to make microhousing its prime target. These activists have persuaded the city council to consider "emergency" legislation that would place a moratorium on building any new microhousing. Seattle is a leader on the nation's bell curve of prosperity, ranking in the top five local economies since 2010, according to a Policom Corporation report. Unemployment is less than 6 percent, construction cranes swing across the skyline, and vacancy rates for apartments are at a scarce 3 percent in some central neighborhoods. Affordable housing is virtually nonexistent. In the past five years, the monthly rental rates for studios have increased 15 percent and one-bedroom apartments have increased 21 percent, according to real-estate economist Matthew Gardner. The price of an average studio apartment in Seattle last month hit $991, and one-bedrooms soared to $1,230, according to the real-estate tracking firm Dupre + Scott. In this environment, microhousing is in high demand. "Kids are coming out of college, and in not much smaller numbers than the baby boom generation—and are they wanting to live in Issaquah?" Gardner asks. "No, they are not. They are going to want to live downtown. But when you start looking at average unit size, it will be increasingly unaffordable. But they are willing to live in a smaller space if the absolute dollars they pay are less." Since I visited that aPodment in 2009—the first of its kind built for that purpose—several developers have applied for permits to construct 44 more microhousing projects, according to the city's Department of Planning and Development. Seven are complete, and 37 others are getting permits or being built. In all, the city forecasts that 2,371 microhousing units are slated to enter the rental market. Many community groups have made it their mission to halt this trend. They see this wave of microhousing as an invasive species. In their eyes, developers stand to get rich by transforming beautiful residential areas—defined by lawns and plentiful parking—into crowded, dilapidated slums of inhumanely small homes with shared kitchens and undesirable tenants. Several new organizations have sprung up to tackle this issue, none more active than Reasonable Density Seattle. A banner across the top of the group's website depicts a sardine can packed with people in an otherwise pleasant neighborhood. The organization warns, "Ultra-high-density developments will permanently alter the character of our neighborhoods, leading to a deterioration of the very quality of life that makes Seattle such an attractive place to live." Other upstart groups that have jumped into the fray include Harvard Avenue Neighbors, Seattle Speaks Up, and Capitol Hill Coalition—in addition to several established community groups that have banded together and passed resolutions asking the city for a moratorium. Their outreach campaign includes signs staked into yards on Capitol Hill that read: "Attention developers, aPodments and other micro-housing developments are not welcome in this neighborhood. The neighborhood is prepared to fight their construction." Capitol Hill activist Dennis Saxman, evidently imagining a slippery slope scenario where microhousing becomes the dominant mode of housing in Seattle, fumed at a recent community meeting, "Would you like this to be the only place to live in Seattle for the next 200 years?" And an action alert e-mail sent last month by local activist Chris Leman warned: "If your neighborhood hasn't been hit yet by microhousing projects (also called 'aPodments'), watch out—it won't be pretty!" He went on, "The units are cramped, lacking living space; kitchens can even be on a separate floor." Leman asked neighborhood groups to pack a city council hearing on April 18 and ask the council to block all microhousing construction until their demands are met. A month earlier, Leman attended a meeting of the Seattle Community Council Federation, a summit of neighborhood organizations with representatives from numerous groups, where Leman lamented microhousing in Eastlake. "Maybe it should be somewhere, but not on a side street. Not near a park or a school," Leman said. And then he quickly added, "I'm not a NIMBY at all." Neighborhood activists hate being called NIMBYs. The acronym, which stands for "not in my backyard," is a term of derision for someone who claims to be fine with whatever is being built, provided that it's not being built near them. The issues that came up in that two-hour Seattle Community Council Federation meeting included preventing people from cutting down trees on their own private land, celebrating how they defeated a bill to allow corner stores in the dense neighborhood of Capitol Hill, lamenting a city law that would allow certain apartment buildings an additional story of height, expressing concern about taller buildings around light-rail stations in Roosevelt and Capitol Hill, advocating that neighborhood groups have more influence over future height limits, preventing large houses from being built on small lots, and, finally, unanimously passing a resolution asking the city council for a moratorium on microhousing. The common thread in those causes: opposing new construction in neighborhoods—in their backyards. When they can't stop construction, they sometimes try to thwart it with appeals. For example, neighborhood leaders in Mount Baker, Othello, and Beacon Hill all filed attempts in 2010 to block taller buildings near light-rail stations throughout South Seattle, even though taller buildings are essential for density and the place to put them is in transit hubs. Up north, neighbors in the Laurelhurst Community Club—who had been fighting the expansion of Children's Hospital—also took a stand a few years ago to oppose taller buildings near the Roosevelt light-rail station, even though that station will be miles away. The way things are shaping up in Seattle, the thrust of neighborhood activism seems to be opposing density. But consider the timing and context: The Seattle area is expecting a population hike of 134,000 residents by 2020, according to the Seattle Times Company's market research. Rental prices are soaring, and, as the New York Times reported on April 27, "Weekly wages of low-paid workers have declined," according to national data from the US Bureau of Labor Statistics. This is to say, neighborhood organizing—a pastime of people who are financially comfortable and have enough leisure time for, well, neighborhood organizing—has come to obsess on stymieing housing, particularly housing that's affordable for lower-wage workers. While the neighborhood groups may argue that they want everyone to have larger apartments, that's not a choice many workers in Seattle actually have. They cannot afford larger apartments. Their choice is between living in an aPodment or living 15 miles outside of town. Accommodating our growing population by shipping workers into the low-density sprawl of the exurbs is not the way a city should operate—and it reeks of inequity and classism. When workers are shunted into areas poorly served by transit, they end up spending a massive chunk of their paycheck (and a massive chunk of time) on commuting. As Catherine Rampell wrote in the New York Timeslast month, the number of college-educated residents of that city has risen by 73 percent over the past three decades, while the number of people without degrees has fallen by 15 percent. All of that reflects a national trend: "Highly paid, college-educated people are increasingly clustering in the college-graduate-dense, high-amenity cities where they get good deals on the stuff they like, while low-skilled people are increasingly flowing out to cheaper places with a worse quality of life." Seattle's median income is $60,665, according to the 2010 census. That average income has been steadily climbing along with property values. As cities like Seattle become wealthier and it costs more to live in them, Rampell explains, the risk is that the income gap will grow wider. Our services and products will increasingly cater to the tastes of the wealthy. Artisanal breads at $5 a loaf, Neapolitan pizzas (delicious but not very filling), and handcrafted beers are becoming the norm. Extrapolated a few decades, our city is on a trajectory to be more expensive to eat in, shop in, and run errands in. Add to that further rent increases that working-class people already can't afford, and we are pushing young people, workers, students, teachers, artists, musicians, writers, and the elderly out of town. If those people don't live in town, they don't frequent the bars or the galleries, they don't dance at the nightclubs or play on the music stages, and they don't go to the independent bookstores or retail shops because they live 45 minutes away. The generators of culture will simply be scattered into the suburbs, disconnected. Not only does this dissipate the creative energy, it neuters the cultural incubators and eventually leaves the cultural institutions weaker. And what is a city without art, culture, youth, and regeneration? This is the city that some people are, unfortunately, trying to turn Seattle into. And what underlies it all is that the city is for the wealthy—coupled with the notion that if you are young and don't have much money, you are "sketchy." So, again, even though aPodments may not be perfect for everyone, they are priced within reach for folks who otherwise couldn't live in the city. And, again, they offer affordable housing without any help from the city's $145 million housing levy. That's crucial because the city will never be able to provide enough subsidized housing with levies, or through zoning incentives, for all the workers who need to live in the city. "Here we have the private market providing housing that is more affordable than the other housing out there," says Council Member Conlin. He says the "need is too great" for government to keep up with. "There are people really committed to this as a wedge issue," Conlin says about the microhousing controversy. "I think the wedge has to do with acceptance of the idea of density and transit being the future of Seattle. People don't want to accept that, and they see it as a threat to their way of life." The NIMBYs fear change, any change, and they are taking it out on microhousing. They see an opening, a chink in the armor in permitting loopholes. But are their technical complaints valid? Some complaints about microhousing are, indeed, reasonable—and others are hysterical. Or, as Council Member Conlin describes it, there are "legitimate complaints," and then there are people upset that "something is changing in the neighborhood." On the far end of that spectrum is Kristina Danilchik, who attended the April 18 city council hearing on whether the city should place a moratorium on microhousing. "A certain percentage of roommates have mental problems," Danilchik alleged, adding that shared housing could be risky for those living on the same floor as a meth addict. "They never stop tweaking. They don't sleep. Right now, I know of a rooming house where there are fights over the shared kitchen." And in another such building, which she didn't identify, "guys sleep with a knife under their pillow to stab the other guy." Or take Bill Bradburd, a Central District landlord and a leader of the Seattle Neighborhood Coalition, who gave a presentation on the matter before the community federation and explained part of his objections like this: "The concern is that the people coming will not be part of the community—they are not going to stay. If the units were larger, people could stay longer. But there is no room for anything, not even a bicycle. Where will they go? The bicycles will get chained up around signposts and to trees. The seats will be stolen and then there will be dead bicycles all over the place." Obviously, the specter of microhousing as incubators for knife-wielding, drug- addicted maniacs running amok in a neighborhood littered with abandoned, broken bicycles is completely nutty. It doesn't dignify a response. But those fears are at the far end of the spectrum. In the middle of the spectrum, many of the complaints seem compelling—at least at first blush. I've heard the following arguments at least 10 times each: (1) The buildings are firetraps because they have a single egress, (2) they will degenerate into dilapidated slums that must be torn down after a decade because they're made with substandard materials, (3) the tenants will have criminal backgrounds, (4) by renting these tiny units out from $500 to $800 a month, microhousing will increase the rates for larger, traditional studios and apartments, (5) they are cash cows for developers and rip-offs for residents, (6) they will take over and become the only type of housing in Seattle, and (7) because the city doesn't require on-site parking, tenants will jam the streets with their cars. 1. 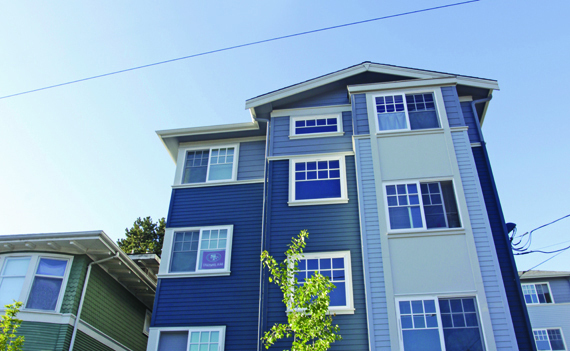 Microhousing is constructed to the same fire code as other buildings in Seattle, outfitted with sprinklers and fire alarms, and approved by the fire department. 2. Likewise, microhousing structures must meet the same building codes as regular apartments. No reason exists why these buildings would deteriorate faster than others. "We are building these buildings to own them—we are not trying to build anything that's cheap," explains Kelten Johnson, whose firm, Johnson Carr, is building microhousing in Wallingford and Eastlake. His buildings actually feature triple-pane windows and more insulation than most apartments. 3. Although Carl Winter, head of Reasonable Density Seattle, says that "they don't do credit checks," that's not accurate according to my research. "We do background checks and credit checks on all of our customers," explains Jim Potter, who is developing six microhousing buildings. I obtained tenant applications for other microhousing units that ask about applicants' bankruptcy history, evictions, late rental payments, income sources, and bank references. 4. Microhousing is more expensive per square foot than regular apartments—this is indisputable. A policy analysis conducted by the city found that the average one-bedroom apartment rents for about $1.85 per square foot, whereas microunits average $3.24 per square foot (but that figure doesn't account for the shared kitchen, hallways, or utility areas in microhousing). But do those higher costs per square foot drive up rental rates per square foot of larger apartments? "No, it doesn't work that way," says Gardner, the real- estate economist. The reason, he explains, is that apartments have an inherently inverse relationship between size and price—even large, expensive houses can cost less per square foot than small homes. "The smaller the unit, the more you can get per square foot," he says. "The larger the unit, the less it costs per square foot. To say that these will increase the cost of overall rentals, there is no basis for that argument." 5. Although the rental rates per square foot are higher, developers aren't making an unusual profit. Labor rates are up, lumber is more expensive, and equipment costs are higher due to extraordinary demand, Gardner explains. And microhousing buildings are small—many are built on a single or double lot—which limits profit potential. 6. Will this be the only type of rental in Seattle "for the next 200 years," as activists have claimed? "Absolutely not," Gardner continues. "It's asinine to make that statement." Although there is demand for microhousing—there is demand for all types of housing—it's not like everyone in Seattle will decide they want to live in it. Gardner explains that the demand for any product is "finite." Furthermore, the 2,300 microunits that will hit the market in the next few years are a fraction of the roughly 6,000 apartments coming on line this year (and a tinier fraction of the total 31,345 units already built in central Seattle). 7. As for parking, these buildings can be constructed only in areas zoned for multifamily dwelling units (aka apartments and condos). And in many of these areas, the city doesn't require on-site parking. "Our policy approach is to limit the requirement for parking spaces," explains Council Member Conlin. And as it happens, free parking in front of your house isn't a constitutional right. So it turns out that many of the complaints the neighborhood groups are using are frivolous, wrong, or representative of policy that's been long settled. Concerns about the fire code are perhaps worthwhile—adding a back door seems sensible enough. But that sort of tweak wouldn't affect microhousing's neighborhood impact. Which brings us to two legitimate complaints. These may seem fussy, because they deal with taxes and permits (egad! ), but bear with me. Critics including Winter, Reasonable Density Seattle's leader, point out that microhousing developers are receiving tax breaks that they don't deserve. Under the Multifamily Tax Exemption Program, the city grants a full property-tax break for 12 years on new properties with inexpensive units. Microhousing developers have applied for that tax break in a sneaky way: They provided the city's Office of Housing with the number of sleeping quarters in order to qualify for the tax exemption (the units rented for under $775), but then those same developers provided the number of clusters—the number of kitchens, essentially—for building permits. This sleight of hand avoids a public design review process and environmental review that would be required for a traditional apartment building. As Reasonable Density Seattle puts it, "We believe that developers are playing games with these numbers to skirt the review process." The complaint is indisputable—but it's a small fix. Rick Hooper, head of the city's housing office, decreed in March that developers must provide the same number of units on applications to both the housing office and the planning office. So that problem has been solved. Still, activists insist that microhousing needs to undergo a design review that will provide "public notice, comment, and appeal opportunities," according to Leman, the activist who sent out the action alert. But to understand what design review is, it's essential to understand what design review isn't. Conducted by volunteer boards, design reviews don't decide a building's height, rent, parking, tenancy requirements, or fire code. All the design reviews do is provide input on a building's aesthetics. That's it. The review boards make recommendations on subjects including the shape of the windows, the color of the bricks, the placement of awnings, and other superficial elements like those. The complaints about density, parking, zoning, taxing, etc.? Design review won't address them a bit. And our neighborhoods are not in peril. Single-family zoning covers a whopping 64.7 percent of the city (areas where you can build only houses), and multifamily zoning covers 11.1 percent of the city (areas where apartments are allowed). That is, only about one-tenth of the entire city allows apartments and microhousing—and that zoning has been on the books for years. So when Reasonable Density Seattle says that microhousing represents a crisis that will "permanently alter the character of our neighborhoods," they're dramatically exaggerating. Tick through the neighborhood groups' complaints and they don't add up to a logical argument. Lacking substantive points, activists strenuously opposed to microhousing come across as simply people who have got theirs—their little piece of the city—and don't want change in their backyard. To the extent that new residents are welcome, they need to have money, they need room for lots of stuff, and their homes need to be beautified by design reviews. But there is another implied lie about design reviews. Microhousing, like all new construction, must conform to each neighborhood's design standards, and the city's planning office must approve it. What public reviews will do is give activists a chance to obstruct microhousing by quibbling with the appearance. If this is extended to environmental reviews, it will also allow people to appeal—which Leman says is one of his goals, and was the tactic when neighbors opposed taller buildings around light rail. But those reviews wouldn't make the tiny apartments go away. The apartments wouldn't look substantially different, wouldn't house fewer people, and wouldn't put fewer cars on the street. None of the neighbors' technical concerns would be addressed. If the city pursues design and environmental reviews—which could improve the aesthetics and aren't inherently flawed processes—they should be administrative reviews. They should be conducted by city staff who notify the public but limit input to letters in writing. They shouldn't involve neighborhood meetings that are easily sidetracked, shouldn't require multiple revisions to the architecture, and shouldn't allow appeals. If the public is allowed to obstruct these projects—and their arguments thus far have been specious—the results will be predictable: Every time developers must redesign the buildings to satisfy the neighbors, every time the project is delayed for further review, every time a spurious appeal is filed, the more it costs to build that project. And that has one predictable outcome: It will make them more expensive to rent, i.e., fewer people will be able to afford them. In other words, whether deliberate or not, the effect of neighborhood advocacy and its input on development projects will make living in these places more expensive and push out workers with less money. That would seem like a terrible mistake—unless pushing out poor people is the actual goal. The fanaticism of neighborhood groups opposed to microhousing is hard to fathom. I can only imagine how angry these neighborhood busybodies are going to be at me for writing this article, although I have an inkling. I've taken the brunt of their anger by just trying to collect the facts for this piece. In March, I began looking into the hubbub over a 65-unit apartment building proposed by Plymouth Housing near Third Avenue and Virginia Street. The nonprofit builds homes for people who are transitioning off the streets and into stable residences. The proposed seven-story structure doesn't qualify as microhousing, but it is full of small apartments, and it has provoked furious opposition from neighbors. Evidence of the opposition came in the form of two large, glossy mailers sent to nearby residents under the auspices of something called the Downtown Seattle Neighbors Alliance, which encouraged people to protest this building. In a series of questions that read more like accusations, the mailers argued that the building could be a magnet for criminals. One of the mailers suggested the building would be a "dangerous and/or noxious" presence and that it "has the potential for causing major community or health impacts." The mailers even said that the residents will be homeless people who have failed in previous housing, a charge Plymouth called "misleading" because the building will be designated solely for residents who "have demonstrated a long-term track record of stable and successful tenancy with Plymouth." So who is the Downtown Seattle Neighbors Alliance—and who do they represent? That's what I wanted to know—because the alliance has no online presence or phone number, and I'd never heard of it before. As I reported at the time on Slog, The Stranger's blog, some calls led me to Swifty Printing, located immediately next door to the proposed construction site. "The owners of the adjacent building own a printing company and are responsible for the mailing," Bryan Stevens, spokesman for the city's Department of Planning and Development, told me. One of Swifty Printing's owners identified himself at a design review meeting as a member of the Downtown Seattle Neighbors Alliance, so naturally I called Swifty Printing to ask if they were involved in the group and to confirm they had printed the flyer. Jack Nikfard answered the phone, said he was a partner in the company, and said the business was a member of the Downtown Seattle Neighbors Alliance, but then he refused to answer any more questions. He said if I had questions, I had to e-mail Lori at the e-mail address printed on the flyers. I e-mailed Lori—as others have before me—but I never heard back. But the name Lori Nikfard comes up in King County property records as sharing property on Lake Sammamish with George and Jack Nikfard. Still, I didn't know for certain that these were the people printing the flyers, nor did I know who else was involved, nor what their beef was with the new neighbors. So I ventured down to Swifty one day to ask. When I arrived, I immediately asked the man behind the counter if he was Mr. Nikfard, and he said he was. "Are you George or Jack Nikfard?" I asked. When he demurred, I asked if he was "the man I spoke to on the phone last week, and is your wife Lori Nikfard, because I'm wondering..."
He cut me off. "Why do you want to know about my wife?" he asked. I began to explain that I was a reporter and that I didn't want to know about his wife, I was merely trying to figure out if he was Jack Nikfard, the same person I spoke to last week. He cut me off and began yelling. The gist of his yelling was that I should leave and he was going to call the cops, so I proceeded toward the door. But he began to call the police anyhow, so I got out my business card to verify that I was, indeed, a reporter, adding that I was only trying to make sure I was talking to the right person. But I continued walking out, and as I did, something crazy happened: Another man came out from behind the counter, grabbed my arm, and pushed me away from the door, into a corner of the store, so I couldn't leave. "You need to stay here," Nikfard barked. On the phone with police, he said his name was George and he accused me of "harassing" him. So, literally backed into a corner, I stayed put until the police arrived. "Stay right here," he told me again. I never resisted—I had only asked a few preliminary questions and wasn't breaking any laws—so I was happy to stay put to explain myself to the cops. Officer Michael Virgilio arrived after a few minutes. "I want to make harassment charges because he has no business in here," Nikfard said. He said a video camera in the room had recorded the entire incident. When it was my turn to speak, I explained that I was trying to leave—this was undisputed—and that if, indeed, that camera caught it all on tape, I'd be happy to enter the video as a court record that showed me walking in, asking a couple questions, and then trying to exit the shop. "Asking questions is not harassment," Officer Virgilio told Nikfard, adding, "It doesn't fit harassment charges because you asked him to leave and he was trying to leave." It was such a bizarre experience that I felt obligated to turn the tables: I asked the officer if Swifty Printing employees had possibly assaulted me, given that I was trying to leave and they grabbed me, pushed me, and detained me against my will. Wasn't I the one who could arguably be pressing charges? I declined to file a police report—the incident was already such a stupid waste of police resources—but the irony was too much to bear: Downtown Seattle Neighbors Association claimed in mailers that the homeless people outside were the ones breaking the law, but when I approached the only people I could find who claimed to be part of the association, they were the ones who appeared to break the law. And then the best part of all happened. At least in terms of confirming that Swifty Printing had produced the mailers. When Officer Virgilio asked about the mailer in question, one of the employees went behind the counter and returned with a crisp, unmailed copy of it. After a recent community meeting about microhousing in Eastlake, where a sign stapled to a utility pole warns that these undesirable buildings "are permanent and will last a long time," I interviewed David Brazeau, who owns an apartment building adjacent to one of the controversial pending construction projects. Brazeau fears his "property value is going to be diminished," he told me. "I view that the tenancy is going to be transient," Brazeau said. "Maybe the screening of people won't be as thorough as regular apartments. I'm not going to say it is a magnet for criminal activity, but it is easy come, easy go." Brazeau also admitted, "I've never been in one, but I don't know why anyone would want to live in one." So I went to find out. One weekday in Wallingford, I visited a microhousing building offering tours for potential tenants. One of the people getting a tour was Mary Richardson, a claims representative for the Washington State Department of Transportation. She told me she's been sharing a house with a friend who's moving out, and was now looking for an apartment she could afford on her own. "In the situation I'm in right now, I can't be too choosy," she explained. Richardson was looking at units in the building, where rents range from about $600 to $1,200 and include all utilities and Wi-Fi. She particularly liked one that cost $800 a month. That beat everything Richardson had seen—the least expensive apartments she's found were $1,000 or more, and adding utilities and internet, they would exceed $1,200. "I can't afford that on what I make, because then I won't have any money left over to live," she said. "This is all I could find in my price range." Finding a traditional apartment she could afford would mean living far outside of Seattle, and as she put it, "I am not moving to Everett." Walking through the newly finished units, with compact but neatly designed bathrooms, deep steel sinks in each unit's kitchenette, and finished concrete floors, Richardson said, "I think they are cool." One of her favorite units would rent for $800, and while she acknowledged it's "a little small," it also had an unobstructed southern-exposure view of the downtown skyline and Mount Rainier. Is Richardson transient and sketchy? "No, I'm not that person," she said, laughing. "Even if you are that person, you look at this building and know you don't fit in here." Richardson said she'd have her daughter over to visit, and that if she moves in, "I will live here for at least five years." Richardson is like other microhousing tenants I've heard from. Judy Green, 67, who lives in an $850 a month microhousing unit in the University District, recently testified before the city council that she opposes a moratorium. "I want you to consider that there are people like me who are happy in a place like this," she said. "My unit is lovely, and the building is attractive. I can walk to stores and parks, and I can afford to live there." I also caught up with a resident of an aPodment building on First Hill, Alex Tursi, a 29-year-old graphic designer who's a contract employee with Microsoft. He acknowledged it was small space, but "the sacrifice of the space is an equal trade-off to have my own spot," he said. His last home, with comparable rents in the neighborhood, was in a house "with people I found on Craigslist, and I lived with strangers, and one of them was just a nut." So Tursi moved out. The shared kitchen in his aPodment is clean, he said, and his kitchenmates are young professionals, including a couple Amazon employees. "There's nothing remotely sketchy about any of this." While I was talking to Richardson out in Wallingford, I asked her what she thought of the uproar, what she thought of the idea that tenants like her posed some sort of threat, what she thought about the conviction that these units were somehow an example of substandard living. "There are some people who don't like change," she said. "Anybody who has said that has not been here to see it." You know who's conspicuously missing from the war on microhousing? The people who already live near microhousing. So I returned to that aPodment building near 23rd Avenue and John Street, the place where I met Alan Gossett, the first aPodment building built in that style, to ask the neighbors: Was it, in fact, a magnet for sketchy people? "It hasn't turned out that way," said Julia Dallas, who lives across the alley from the building. Dallas is the director of human resources at the clothing manufacturer Filson. "If it was run-down, that would be one thing, but they have done a good job keeping it up," she said. "It seems like a lot of students, young professionals. You don't see sketchy people." That's the same story I heard from Adam Gross, owner of a town house right behind the aPodments. Gross is a vendor manager of video games for a major local tech company, and a new father. "As you can see just looking at it, it's not dilapidated," he said. "I have never seen anyone you would describe as homeless or transient there, and it's not sketchy—unless you consider mountain bikes sketchy." I spoke to other neighbors, too, and they all acknowledged parking could be tight nearby and the building's residents sometimes brought heavy foot traffic. But as Dallas put it, "It's not like they are loud, and they haven't been messy." King County records show that property values in the area, including the house that Gossett owned, continued to rise despite the aPodments. Still, neighborhood activists are calling for emergency legislation to stop construction of new microhousing—to stop this ostensible scourge—and they want regulations that gum up the works and don't substantially change the buildings, just make them more expensive to live in. Council Member Tom Rasmussen has been eager to serve as their agent to pass these laws, to do something. But what's so bad about new neighbors? Renee Staton, a former leader of the Pinehurst Community Council, says she used to fight new construction, too, particularly town houses. But she's had a change of heart. "In Pinehurst, we had a huge number of these buildings being built. I was really concerned, and it felt like the character of the neighborhood would change. I struggled with it. I will be honest, I was very upset about these being built in my neighborhood. I personally fought against trying to build town houses. But in holding meetings, some of the people who lived in the town houses showed up, and they were wonderful people. And they asked me why I didn't like the people who live in the town houses, because that's them. And all of us at that meeting had to think really hard about what it means to be a community. That moment really changed my perspective." Years later, Staton admits that she had been wrong. She appreciates the newcomers in Pinehurst, because their presence means "there are more wonderful people in my neighborhood," she says. "More people are in the parks. More people are at the grocery store. More people are in the community meetings." "Renee Staton, a former leader of the Pinehurst Community Council, says she used to fight new construction, too, particularly town houses. "But she's had a change of heart. "She appreciates the newcomers in Pinehurst, because their presence means 'there are more wonderful people in my neighborhood,' she says. 'More people are in the parks. More people are at the grocery store. More people are in the community meetings.' "
David, Nice of you to comment. Even though I seldom agree with you, I find your blog http://thegreatermarin.wordpress.com worthwhile read for your thoughtful commentary. I recommend it to everyone. The last line, about the benefit of people is nice but I have to agree with the homeowners who want to maintain the integrity of a single family neighborhood. The mixed development communities are fine if you want to live in them but I fail to see the value of destroying a neighborhood by densification over the will of its residents.